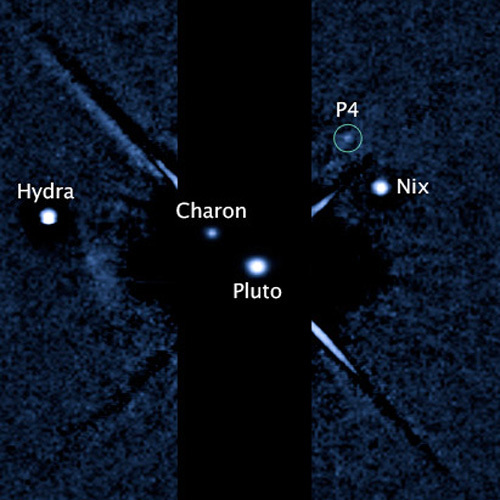 Pluto's three known moons plus P4, a new discovery. As announced earlier this week, scientists using the Hubble Space Telescope have identified a new moon orbiting Pluto. This brings the number of known moons orbiting the dwarf planet to 4. Currently designated “P4” the International Astronomical Union will likely decide on an official name soon…what do you think it should be? PS: I’ve contacted SETI Institute’s Mark Showalter and alert him to this poll…so perhaps your vote will help the decision process! Previous Post Now that’s some groovy rock! I’d like to see Ms Patrica Burney Phair, who named Pluto as a young girl get honored in some way as she passed on just a few years ago…a more mythological name might be Alecto, a daughter of Pluto in some tellings of the ancient myths. Another good proposal was made by astronomer Nick Howes (@NickAstronomer on Twitter) of Acheron. I think Acheron is a cool name, but it references a place (a river). I think it should stick to character names, IMO. There are already two asteroids called Cerberus and Rhadamanthus, so I think these names will not be used for “P4”. I propose the name Thanatos. Thanatos is a brother of Charon. Now why would they waste such a great name for a moon of Pluto on a silly old asteroid?? Erebus is the ship and the volcano named after the ship and the crater on Mars. I never did like Charon and “Hydra!” Why Hydra? She might have been chthonic (Typhon and Echidna) but was never primordial like Nyx and ErebOs. Crowdsourcing is the way to go. More democratic! I doubt they are going to be renaming anything. Hard enough to get them to agree on what even to call something in the first place. I thing your poll is brilliant! Let’s hope for a big sample! I think your poll is brilliant! Let’s hope for a big sample! I did get a response from Mark Showalter at SETI… he said he’d monitor this poll too! For me the better name – and I’ve voted for it – is Thanatos. I think Tartarus might be a good name. Again…cool name, but the name of a place. I was sticking to character names. Break with tradition. Call it Daffy. I’m not joking, I’m serious. We need a name that encourages an increased interest in astronomy by young people. “Daffy” connects with upcoming generations better and is part of the namespace of a “Pluto” that they connect with better. I see your point but I have to disagree. Some things I think it’s good to keep at a certain standard. Go that route and soon we’ll be naming planets “Justin Bieber” and “Spongebob”. Staying relevant does not have to mean ignoring all references to our past. What about “Proserpina” … as the name is written in Latin? Furthermore: If there are more satellites around Pluto, then I suggest the contingency plan to name them: a) Orphnaeus [Orphnæus], b) Aethon [Æþon], c) Nycteus and d) Alastor, … after the dark horses of Pluto. I do think there’s also an asteroid named Proserpina. I propose “Alecto” (the daughter of Pluto in Virgil’s Aeneid) with a “CT” spelling to pay tribute to Clyde Tombaugh, the discoverer of Pluto. It’s on the poll above now. Picked “Sisyphus” for Other. The ethereal madden king destine to struggle forever a ever tumbling boulder in the Underworld and also cleaver mortal who tricked Thanthos thus prevent death and latter and prolong his post-death until his punishment. It got that symbolism thing shrouding it for P4. And he a noteworthy inmate of Hades… the next Underworld theme following after deities (Pluto and Nyx), monsters (Hydra), and the ferryman delivering souls (Charron). Although I voice don’t comprehend this ‘one time myth naming policy’ beyond confusing people. Does the IAU have a page for this? Why not use previous used names (Persephone and Cerbarus, not keen with these either) on astroids which the solar system is defiantly filled with its share of hundreds if not thousands. But verses a more noteworthy solar body? Its ridicules used whatever great names once.